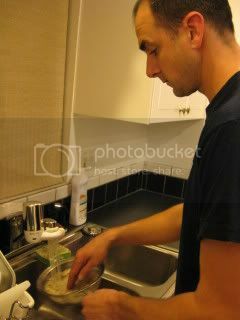 My husband, Jason, basically cannot cook, although he loves to eat good food. But...he makes great rice!!! 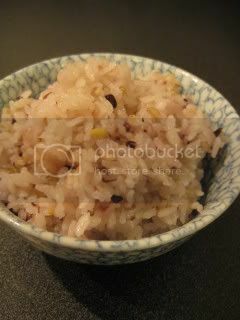 For a rice fanatic like me, if my husband can cook the great rice, I really don't care if he can't cook anything else. Jason totally mastered to cook rice with "Kamado-san", which is a Japanese donabe (clay pot) rice cooker with double lids. You can find more info about "Kamado-san" on toiro's website. Tonight, he cooked 3 rice cups (1 rice cup = 180 ml or 3/4 US cup) of mixed rice (2.5 rice cups of white rice and 1/2 cup of multi-grain rice). After measuring the rice, he rinsed the rice in running water. Instead of cooking the rice with only water, Jason likes to add a little amount of sake (1 tablespoon for each rice cup) for the extra complexity and the shiny result. 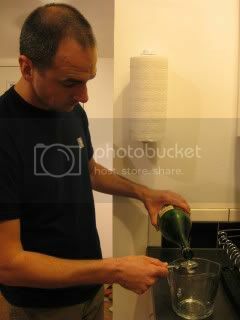 Then, fill out the measuring cup with the addition of the water. For 3 rice cups of the rice, he measured 600 ml of liquid (water+sake). 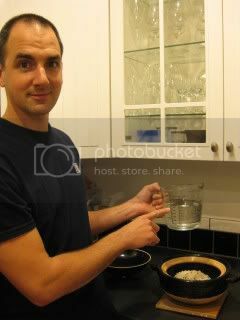 That means, for each rice cup of the rice, you need 200 ml of water to cook with. 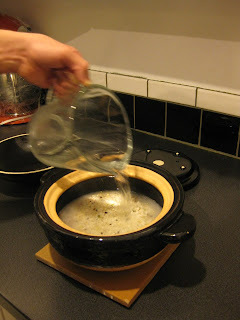 Once the rice is soaked in water for 20 minutes, cover the donabe with both lids, then cook the rice for 15 minutes over medium-high heat on the stove top, and let it rest for 20 minutes uncovered. Voila! 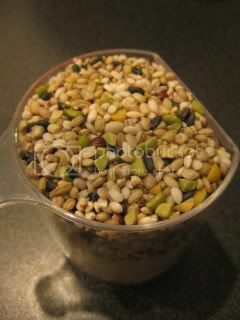 This is the beautiful shiny multi-grain rice made by Jason.